Staff are the most valuable asset for most companies, particularly for scale-up businesses. Having effective talent management processes in your business to manage, nurture and retain your staff means that you have the right people and skills to achieve your business strategy, now and in the future. 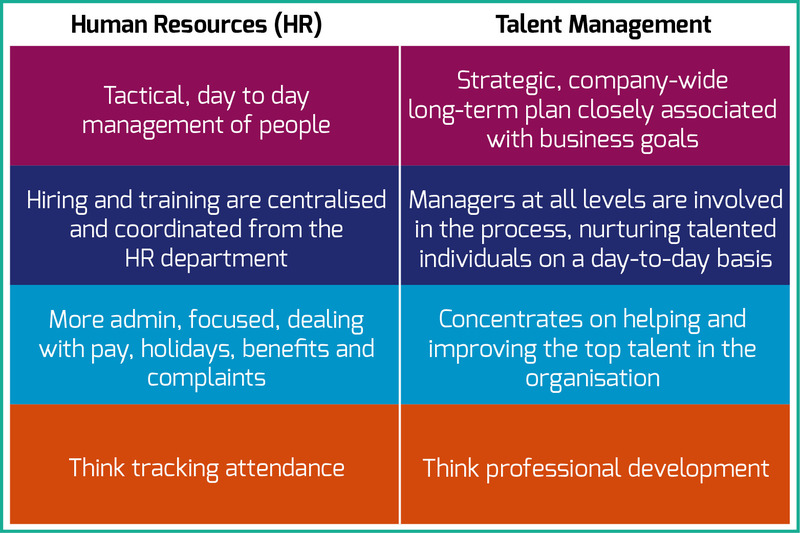 Talent management is a set of integrated processes designed to attract, develop, motivate and retain productive, engaged employees in your organisation. A thinking shift for many, it looks more at whether a person is a good fit for the company as a whole, bearing in mind any future roles, rather than simply the current position you’re recruiting for. It gives talented individuals the opportunity to progress through your organisation, instead of you recruiting externally for jobs – in particular, leadership positions. By taking stock of skills in your organisation, you’ll make sure you have the right people doing the right jobs. You’ll close skills gaps in your organisation by identifying them and taking action. You’ll empower your staff by showing them that you’re valuing them and investing in their future. You’ll be less likely to lose your top talent to your competitors by placing an emphasis on employee retention and engagement. You’ll make fewer hiring mistakes, as you’ll be focused on the values and behaviours of individuals when recruiting, rather than just what’s written on their CV. How is it different from HR? What should a talent management strategy include? To be successful, a talent strategy should be reviewed regularly and evolve with the business, at the same time as the overall business strategy develops. What leadership skills and qualities do you need to deliver your current and future business objectives as you scale up? Where in the organisation is your leadership talent now? Where are the skills gaps? Should staff in your organisation be developed internally to provide the missing pieces as you grow, or do people need to be recruited externally? How can you ensure that your business is attracting and recruiting the best talent, developing them in line with your objectives, retaining them in your business and deploying them in the right roles at the right time? As an organisation as a whole, what are you recruiting for? It’s important to recruit not just to meet your current needs, but keeping your future objectives in mind. Consider the values, traits and behaviours you need in your company, and how adaptable the person could be, rather than simply the skills you require for a particular role. Once you’ve outlined the qualities of the individuals you’d like to recruit, consider if you’re able to attract the right talent above your competitors. Each generation within the workforce will have a different relationship with your company, and will tend to be attracted by different benefits, so it’s important you’re able to adapt. For example, many in the ‘baby boomer’ generation are concerned with title, salary and more material assets, whereas ‘generation X’ tend to look for the full package with a good work-life balance and opportunities for personal growth. In contrast, millennials value challenging work and strong development that fits with their own ambitious career plans. For your talent management strategy to work in practice, it’s vital that managers and leaders at all levels are committed to highlighting ‘hidden gems’ in their teams and supporting talented individuals. Continuously developing staff in your business - particularly those identified as ‘high potential’ - enables you to respond to change quickly, keeping your leadership agile and focused on future goals. When considering the ‘whole organisation’ approach, the focus should be on concepts such as strategic thinking and the ability to deal with complexity, rather than simply their technical ‘know-how’ for a specific task or role. Once you’ve attracted, recruited and developed members of staff that are perfect for your business, it would be a real blow to then lose them to your competitors. For your organisation to retain the truly talented individuals you’ve invested in, it’s essential to keep them engaged by creating a set of unique benefits in working for your company. In addition to paying a competitive salary and offering performance-based benefits, successful scale-up businesses invest in engaging staff with a learning and development culture that shows ambitious employees how they can progress with the growth of the business. The overall plan with talent management is to have the right people with the right capabilities, motivations and commitment in the right part of your organisation at the right time to deliver and lead your business strategy. To do this, make decisions about deploying people into particular roles that are aligned with your overall vision and strategy for the business, rather than just what’s easiest at the time. Always try to think about what a certain task or role will teach that individual, and what it will add to their long-term progression. To avoid this, sharing staff across the company should be encouraged from the outset, with the view that their involvement in other areas of the business will benefit all teams and departments in the long run and prevent talented people being retained in one place.